Uglyworld #948 - Totoro, Sunset & Sylvenstein Lake, originally uploaded by www.bazpics.com. As you knows I often likes to explores new places and thingies, so after hearings from an olds friend that he would likes to joins me on my travels today I couldn'ts say no's! 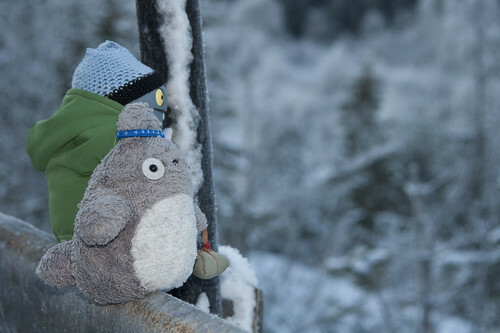 If you doesn't alreadies know Totoro he is originallies famous backs in Japan, but is currentlies livings with his humans friend Andrea (or Pucki as he says she likes to be calleds). I wanteds to gets a nice photographer done with me and Totoro today and eventuallies Baz manageds to gets this one while we was watchings the sun settings over the tops of Sylvenstein Lake which is so closes to Austria that you can almosts reaches out and touches it. I musts says thanks to Totoro for the companies today, as he can speaks the local lingos much betters than me so is invaluables to haves around in such places...!! !